The following is my translation of the text. So, what Kata are handed down in Tomari-te? Let’s introduce them while taking into account the history of their transmission. Matsumora Kōsaku (1829–1898) received three years of instruction in Tomari no Naihanchi from Uku Karyū (1800-1850). [From Matsumora] It was handed down to Nakazato Bokuhitsu (1835–1902?). From Nakazato Bokuhitsu it was handed down to Nakasone Seiyū (1893–1983). Of Naihanchi there are the varieties of Shodan, Nidan, and Sandan, each of which has different characteristic techniques. This Kata has been handed down from Teruya Kisō (Kishin? )( 1804–1864) to Matsumora Kōsaku. From Matsumora Kōsaku it was handed down to Iha Kōtatsu (1873–1928) and Maeda Ginin (1840–1921). As a representative Kata of Tomari it has finally been inherited by Nakasone Seiyū. Handed down from Oyadomari Eirō (1878–1926) to Heianzan Ryōzen (1901–2000), it was finally inherited by the Gōhakukai. Wankan is a representative Kata of Tomari-te that has been handed down from Matsumora Kōsaku to Iha Kōtatsu. 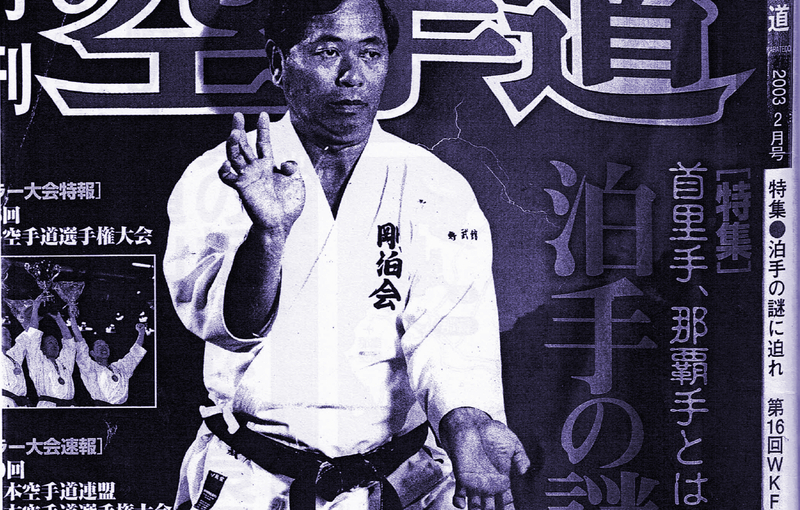 It is a Kata that has finally been inherited by Nakasone Seiyū. Chintō is a representative Kata of Tomari-te that has been handed down from Matsumora Kōsaku to Iha Kōtatsu and has finally been inherited by Nakasone Seiyū. Tomari-te no Kūsankū is a Kata that has been handed down from Matsumora Kōsaku to Iha Kōtatsu and that has finally been inherited by Nakasone Seiyū. Rōhai is a Kata that has been handed down from Matsumora Kōsaku to Iha Kōtatsu and that has finally been inherited by Nakasone Seiyū. Passai is a Kata that has been handed down from Teruya Kishin to Matsumora Kōsaku and Oyadomari Kōkan (1827–1905), and [further] to Iha Kōtatsu and that has finally been inherited by Nakasone Seiyū. Particularly Oyadomari Passai is widely known and is a representative Kata of Tomari. Rinkan is a Kata that has been inherited from Nakasone Seiyū, but it is unknown who instructed Nakasone Seiyū in it. “Shuri-te, Naha-te toha kotonaru maboroshi no Karate – Tomari-te nazo ni semare!” (Extremely rare Karate different from Shuri-te and Naha-te – Approaching the Mystery of Tomari-te!) In: Gekkan Karatedō. February Issue 2003. Fukushōdō 2003. Gekkan Karatedō. February Issue 2003. This entry was posted in Unknown Ryukyu and tagged Gōhakukai, Nakasone Seiyu, Rohai, Tokashiki Iken, tomari-te, Wankan, Wansu. Bookmark the permalink.